During the days preceding Pessah, preparing lighter, healthier meals is on many cooks' minds, to help prevent the almost inevitable holiday weight gain. It's common knowledge that the best way to make menus more nutritious is to eat a higher proportion of vegetables relative to other foods. Although this seems time consuming, there are plenty of shortcuts to vegetable preparation that are especially useful during this busy pre-holiday season. Nava Atlas, author of The Vegetarian Five-Ingredient Gourmet, advises pairing fresh produce with high-quality convenience foods, such as canned beans, quick-cooking grains, and ready-to use soy foods. She also advocates menu planning and notes, "I was amazed to discover how much time is saved by a mere 15-minute weekly meal-planning and shopping list-making session." She makes three menus for the week, and uses the leftovers for three other nights. If you don't have time to slice or dice extra vegetables, remember the wonderful selection of frozen vegetables available at the market. They cut down on both preparation and shopping time. I always keep a few packages in my freezer for days when I have to get a meal on the table in minutes. One of my favorite timesaving techniques is to slip vegetables into a dish that is already simmering. When you are making a chicken stew or a meat soup, simply add cut vegetables while the chicken is cooking. In addition to the standard soup/stew vegetables of onions, carrots, potatoes, turnips and celery, you might like to stir in some cut kohlrabi, peppers, mushrooms, green beans or cauliflower. Since these vegetables cook quickly, put them in the pot when the chicken or meat is nearly tender, or, if there's no room, remove the meat and add the vegetables afterward. If you are boiling water to cook pasta, you might as well add quick-cooking vegetables like cut broccoli, asparagus, summer squash, carrots or peas to cook with the noodles. For rice pilaf, in addition to the usual sauteed onion, I often add finely diced carrots, pepper strips or peas to simmer with the rice. Doing this has the added advantage of convincing reluctant vegetable eaters, who may not be enthusiastic about seeing a plate of steamed vegetables set in front of them. Vegetables have much greater appeal when mixed with pasta or rice (which usually comes with a little olive oil or butter) or when they've absorbed flavor from the sauce from stewed chicken. This colorful dish features the popular Latin American combination of squash, peppers and corn and is quick and easy to cook. On its own, this vegetable medley makes a great accompaniment for just about any entree, from grilled fish to poached eggs. To turn it into a quick main course, stir in cubes of tofu, cooked lima beans, strips of cooked chicken or chunks of chicken or turkey sausages, or top it with a few cubes of feta cheese. It may seem unusual to pair corn with pasta, but in fact this medley is very good tossed with cooked spaghetti and flavored with fresh basil and extra virgin olive oil or with a spoonful of pesto from a jar. To prepare a variation by cooking pasta with the vegetables, see Note following the recipe. Quarter zucchini lengthwise and slice 1 cm. thick; the zucchini will be diced. Heat oil in a large saute pan over medium heat. Add peppers and saute 5 minutes. Add zucchini, corn, and garlic and mix well. Cover and cook over medium-low heat, stirring often, about 10 minutes or until zucchini are crisp-tender. Add green onions. Season to taste with salt, pepper and cayenne. Serve hot. Note: Vermicelli with zucchini, peppers and corn: Cut zucchini and peppers in thin strips instead of dice. Cook 225 gr. to 340 gr. vermicelli or spaghetti uncovered in a large pot of boiling salted water for 6 minutes or according to package directions, until al dente, adding zucchini and corn for last 2 minutes. Drain well. Saute peppers as above, taking only 5 minutes or until just tender, add garlic and saute 1 minute. Toss with pasta mixture and seasonings. Add 1 to 2 tablespoons extra virgin olive oil and 1 to 2 tablespoons shredded basil or pesto, or to taste, and adjust seasoning. A tomato sauce accented with white wine and herbs makes a delicious cooking liquid for the chicken and its colorful vegetable medley. If you have room in your pan, you can cook the onions and carrots at the same time as the chicken pieces. If you don't have baby onions, buy fairly small onions and quarter them. To make the dish more quickly, you can omit the step of browning the chicken pieces. Serve this chicken for Shabbat or any festive occasion. You can cook turkey, veal or beef the same way; simply adjust the meat's cooking time. For a variation, frozen lima beans or fava beans are good alternatives to the peas. White or brown rice or couscous is a good accompaniment. Heat oil in a large nonstick saute pan or deep skillet over medium-high heat. Add chicken pieces in batches and brown them lightly. Reduce heat to medium if necessary. Remove chicken. Pour off the oil into a bowl, and return 1 tablespoon of it to pan. Heat over medium-low heat. Add chopped onion, and cook, stirring occasionally, about 5 minutes or until softened. Add garlic, then tomatoes, thyme, marjoram and bay leaf and bring to a boil. Return chicken to pan, add wine, salt and pepper and bring to a simmer. Cover and simmer over low heat, turning pieces occasionally, until tender when pierced with a knife, about 25 minutes for breast pieces and about 35 minutes for legs. Remove pieces. Meanwhile, put fresh baby onions in a small saucepan, cover with water and bring to a boil. Boil 1 minute. Drain, rinse with cold water and drain well. Peel with aid of a paring knife. If using large carrots, cut them in 4-cm. lengths, then quarter each lengthwise. After removing chicken from pan, add baby onions, carrots and broth. Cover and simmer for 20 minutes or until vegetables are tender. Discard bay leaf. If you prefer a thicker sauce, cook sauce uncovered a few more minutes to condense it slightly. Skim fat from sauce. Add peas and heat until thawed. Add a pinch of cayenne pepper. Taste and adjust seasoning. Remove skin from chicken pieces if desired. Return pieces to sauce. Serve hot. 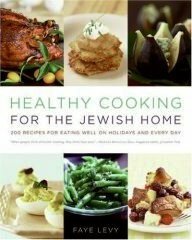 Faye Levy is the author of 1,000 Jewish Recipes.